Thanks for sticking with me and my lack of posts the last few days! I’ve been out of commission for a couple days, but I am back. This weekend I redeemed a Groupon at Roos Rooast, a locally-owned Ann Arbor business selling mostly organic fair-trade artisan coffee they roast themselves. The coffee comes in these adorbs artisan paper sacks. I store my coffee beans in airtight storage, but I couldn’t bear (bare?) 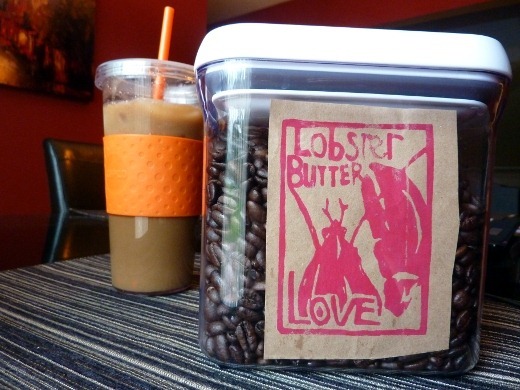 to discard the logo on the packaging from one of the two blends I purchased, “Lobster Butter Love,” Roos’ signature blend. Today I brewed a nice, strong pot using my French Press, which later became iced coffee. When I purchased my coffee I was also given a complimentary made-to-order cup of coffee which was, well, amazing. The beans I ground and brewed at home made an excellent pot of coffee as well. These two duckies have been living in our back yard and our neighbor’s backyard for the last couple of weeks. I’m in lurve with them, they are just way too cute. 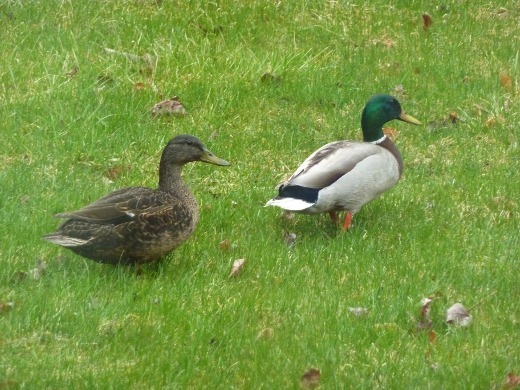 The mallard is constantly watching the female walk around the yard and they never leave each other’s side – it is precious. Maybe we’ll get to see some ducklings in the next few weeks!? 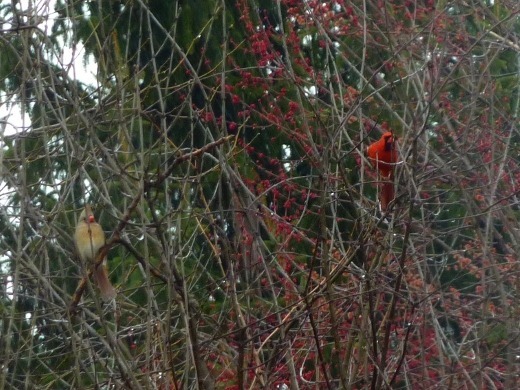 Big Red and Mrs. Red have also been frequenting our trees. Bird lurve is in the air. Okay, next is random, but I found pics on my camera of a couple beers I’ve tried in the last couple of weeks. 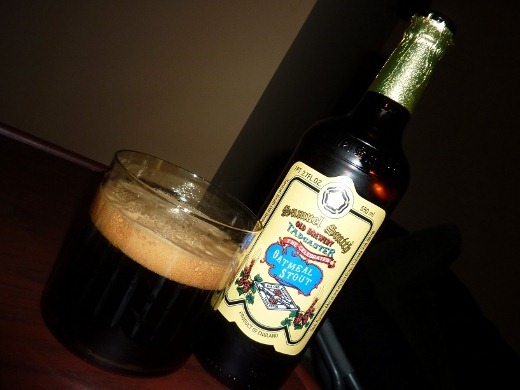 First is Samuel Smith’s Oatmeal Stout – this was quality! I love me a nice dark stout. 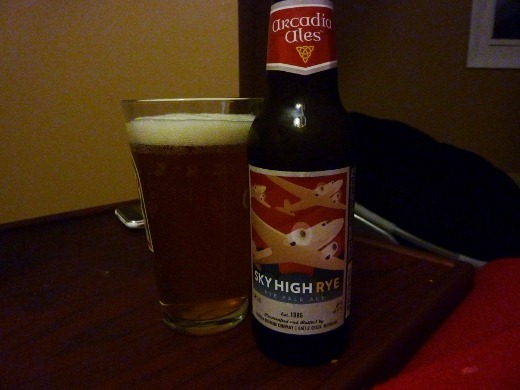 I also purchased a variety pack of some Arcadia Ales brews, and this one, Sky High Rye, was by far my FAVORITE in the box. Love this. Oh, and yes, I upgraded to a pint glass for this picture, rather than using my double-old fashioned glasses. 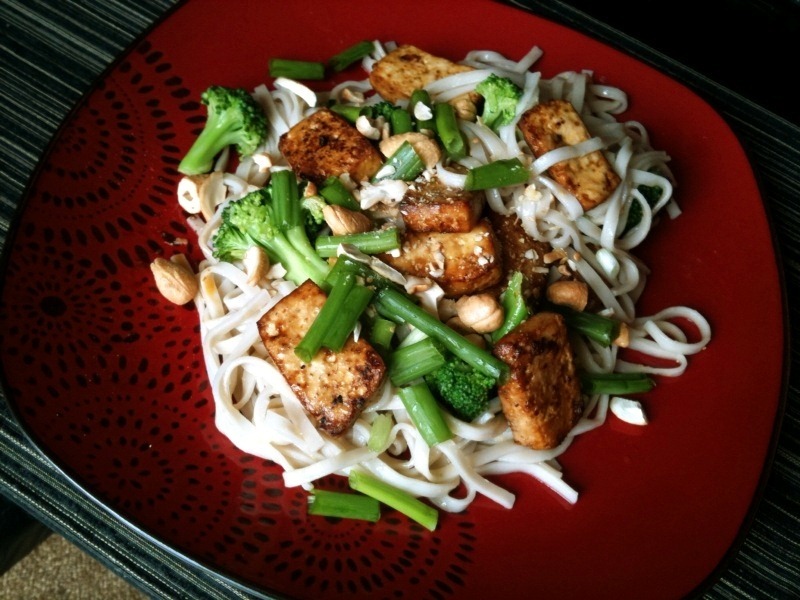 Recently I made this recipe, Udon Noodle Salad, but it was a fail! Despite pressing my tofu for 30 minutes, and baking for more than double the suggested time, the tofu was just soggy and never achieved that crisp outer texture I so enjoy in baked tofu. Also the seasonings were just utterly bland. This recipe is NOT recommended. I DID like the udon noodles and hope to try them in a better recipe. Any suggestions? I have half of a package left. Since the above recipe was a FAIL and pretty much non-salvageable, we improvised and instead went to Chipotle for dinner. 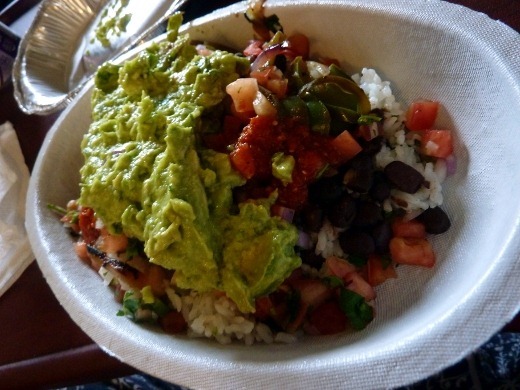 I ordered a Vegetarian Burrito Bowl with rice, black beans, grilled veggies, mild salsa, hot salsa, and guacamole. SOOOO good!! Devoured promptly. The meal below was quite solid, however. I again made Tangy Pulled Pork in my crock pot, and served it atop toasted slices of light bread (40 cals per slice!). 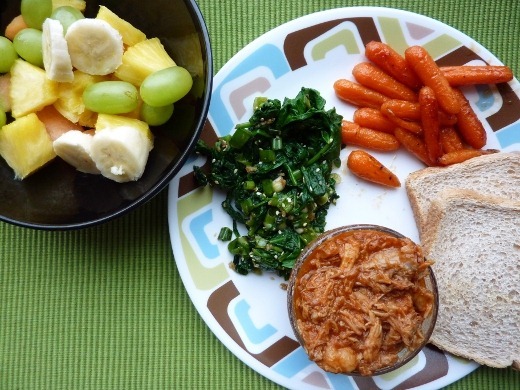 This Pulled Pork recipe is a WINNER! On the side I made oven-roasted baby carrots with maple and honey, and also steamed and seasoned spinach which wasn’t a great recipe, so I’ll spare you the details. Fruit for dessert!! The grapes I bought at the Meijer this week are huge and SO good! Currently listening to: Someone Like You – Adele. Pingback: Easter Sunday « Meg.Goes.Nom.Nom.